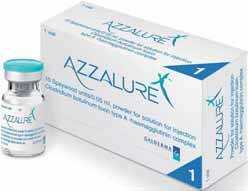 Azzalure®, botulinum toxin type A, has been available in the U.K. since the early 1990s as the brand name Dysport®, which has licences for various indications in 67 countries worldwide, including the United Kingdom and many European markets. It gained approval for cosmetic use in the UK in early 2009 and is marketed for this indication, with dosing specific to treat glabellar (frown) lines, under the brand name Azzalure®. It is manufactured by the French company Ipsen and commercialised by Galderma. Clostridium botulinum toxin (type) A haemagglutinin neurotoxin complex. (125 Speywood units per vial). Azzalure® is made from purified type - A neurotoxin produced by the bacteria Clostridium botulinum. It temporarily prevents the release of acetycholine from sympathetic nerve terminals. Who can administer the drug? In March 2009, Azzalure® was granted a licence in the UK from the Medicines and Healthcare products Regulatory Agency (MHRA) for the "temporary improvement in the appearance of moderate to severe glabellar lines (vertical "frown" lines between the eyebrows) in adult women and men aged 65 and younger, when the severity of these lines has a psychological impact for the patient" . The approval was based on several clinical trials involving more than 2,600 patients. Not recommended by the manufacturer for use in individuals under 18 years of age. Treatment interval should not be more frequent than every three months as this can increase the risk of antibody formation. Bruising, swelling, irritation or bleeding at the site of injection, headache, and rarely eyelid ptosis or diplopia, and brow droop. During the clinical development of Azzalure®, more than 2,600 patients were included in the different clinical trials. In clinical studies, 1907 patients with moderate to severe glabellar lines have been treated at the recommended dose of 50 Speywood Units. Of these, 305 were treated with 50 units in two pivotal Phase III double-blind placebo-controlled studies and 1200 treated with 50 units in a long-term open-label repeated dose Phase III study. The remaining patients were treated in supportive and dose-ranging studies. The median time to onset of response was 2 to 3 days following treatment, with the maximum effect observed at day thirty. In both pivotal placebo-controlled phase III studies, Azzalure® injections significantly reduced the severity of glabellar lines for up to 4 months. The effect was still significant after 5 months in one of the two pivotal studies. Azzalure® is a registered trademark of Galderma. Click for ALL Azzalure ® clinics in the UK & Ireland registered and verified by Consulting Room. 3 out of 5 based on 6 customer reviews.